‘Confined Reflections’ is an installation that explores questions of isolation and confinement. 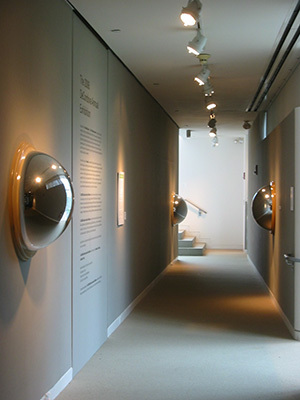 It is composed of wall-hung security mirrors that literally “speak” to visitors. Each mirror tells tales of confinement; they are secret and confessed anonymously. 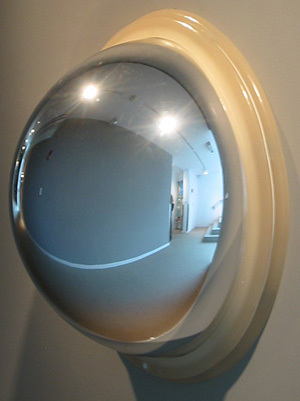 Viewers looking into the dome-shaped mirrors see their own image amidst a distorted version of the space surrounding them. Subverting the mirrors' normal use by hanging them at eye-level and replacing cameras with speakers, we intend an unexpected but visceral connection between narratives of psychological confinement and the reflection of the viewer in the mirror. The work was part of the 2006 Annual Exhibition at the DeCordova Museum in Lincoln, MA.